-And, if you’re really into learning about making all kinds of different cultured foods, I can’t say enough about Wild Fermentation by Sandor Katz. In addition to being full of good info, the author is just plain hilarious. There’s no one way to make cultured veggies. This is really an area where you can mix and match ingredients based on your personal taste, what’s in season, and what’s in your fridge. This recipe is a nice, easy, non-threatening introduction to sauerkraut with lots of other veggies distracting from the sometimes intimidating cabbage. Go ahead, be brave! This is still one of the best things I learned from being on the Body Ecology Diet. Plus, it’s just fun to have something sitting on your counter for a couple weeks blowing bubbles. If you’re like me, you might find yourself sitting and staring at your crock willing it to bubble at you. Much more fun than waiting for water to boil! Speaking of crocks, you can use all kinds of low-tech solutions (described in the links above and all over the place if you google it), but I have to say it’s been worth the investment to get the official German pot that lets gasses out but no air in (for example, the ceramic ones from Cultures for Health, another awesome website). Every batch I’ve made in my 5 liter Schmitt crock has come out perfectly and there’s never been a bit of mold or other weirdness other experimenters describe. Shred the veggies with whatever tool you prefer. I use an old Cuisinart that has a wide feed mouth that I can shove the quartered cabbage through. A good old box grater would work, too. 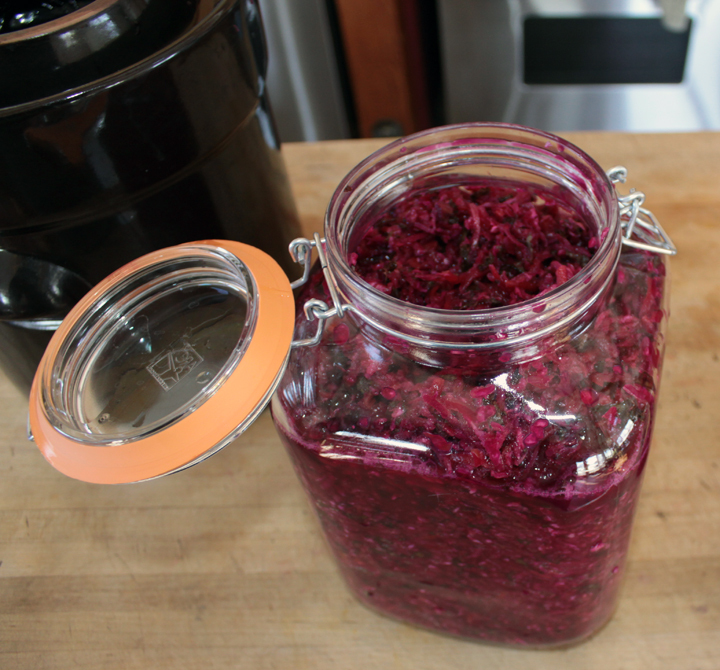 You can even chop by hand with a knife if you like larger pieces for your sauerkraut. Put all the veggies in a large mixing bowl, or two, as you shred them. Mix together well and pour the salt water over them. Pack veggies, a handful at a time, into your crock. Don’t be delicate. Really jam the stuff in there. The more you bruise it, the better. It get’s the juices flowing and the process on the way. Pour any water and juices left in the bowl over the top. Put the weights on top of everything. You want the water to rise a smidge above the weights (prevents any mold from forming), so if you need a little more just add it on top. Check out the beautiful red from the beets! Some traditional recipes don’t add water and rely on the juices from the veggies to fill the crock. This works too, but then you have less juice at the end and have to worry a bit more about the mold issue. I prefer not to have to think about it and like having extra juice to use in soups, as a salad dressing base, and whatever else I can think of. You just don’t want to over-dilute your veggies and slow down the bacterial process. So, just enough to cover the weights and call it good. Similar debate on the salt issue. Those who are over-concerned (in my opinion) about mold and spoilage really salt the stuffin’ out of their krauts. Those who are more concerned with healthy probiotic bacterial action may leave salt out entirely since too much salt will inhibit our friends’ growth. There’s also the texture issue: more salt means more crunch, no salt means smooshy veggies. After experimenting on both sides, my preference is right in the middle. I don’t feel the need to squelch the party entirely, but don’t like fully mushy veggies. So, 2-3 tablespoons for a pretty full 5 liter crock keeps some texture in the veggies, but not too much, and gives a nice flavor without creating too inhospitable of an environment for the lactobacillus and friends. It’s like science class, but tastier! Have fun & feel free to comment if you have questions or insights of your own. This entry was posted in Cultured Foods, Recipes, Snacks, Vegetable Dishes and tagged Candida Diet, Gluten-Free, Vegan by Brooke Bonner. Bookmark the permalink. Hello, We met you folks in Napa last May at Sinskey vineyards. We like your site. I decided to try fermentation. 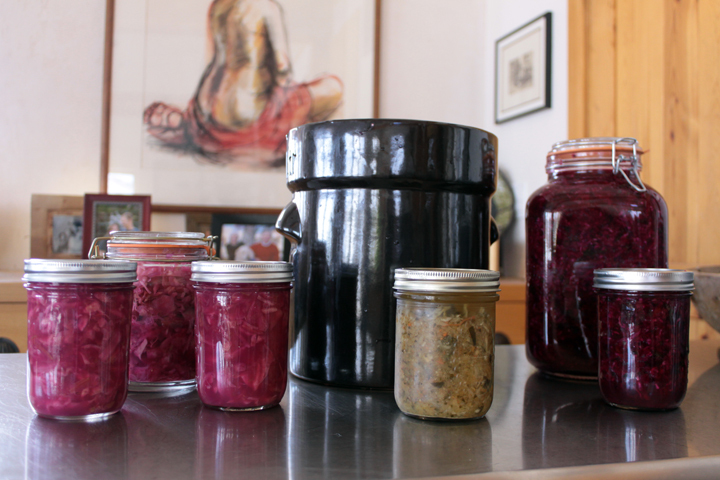 I bought a Schmidt pot and set up my first batch of kraut. Wow it is really smelling up the house!!! I have the well full of water but am wondering if I did something wrong. Any thoughts???? I’ve heard of others having lots of smell coming out of their crocks when fermenting, but we generally don’t have that issue. I’m wondering if it’s a temperature issue… The difference between Idaho & California?? Once in a while, we have a couple days where the crocks are extra active and we get some smell in the house, but usually there’s nothing or just a little if you get right up next to the crock. The days where we get a little smell are usually warmer and timed just right in the fermentation process that it’s once it gets going strongly (a few days in) and before it slows down and stabilizes a bit. What’s the temperature range in the room where you have the crock? That all being said, the smell, while not ideal for the house, is probably not a bad sign regarding your kraut. On a positive note, at least you know the process is working! At the rate it’s probably going, you’ll be able to pack it away in the fridge soon which should solve the smell issue. In the meantime, lots of open windows… 😉 Google around and see what others’ experiences are. Again, my best guess is the temperature. Anyone else is welcome to weigh in here! Carol, let me know how it all works out. Great to hear from you and I’m glad you checked the blog out!